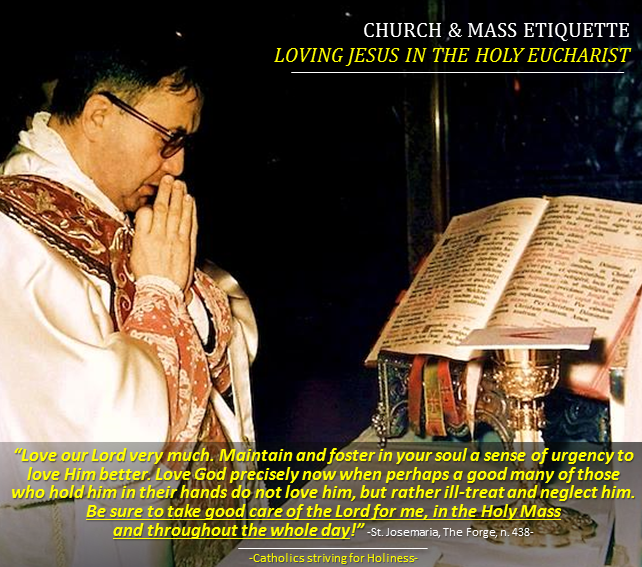 Do I properly conduct myself inside the Church and attend the Holy Sacrifice of the Mass with love, affection, attention, taking care of the details of piety which Our Lord Jesus Christ, who is really present in the Holy Eucharist, deserves from me? -St. Josemaria, The Forge, n. 645. We can apply these ideas and examine ourselves: How is our love for Jesus in the Holy Mass, in the Eucharist? Our love for Christ is palpably manifested by the love and attention we place to how we attend and take care the Holy Mass and how we comport ourselves inside the Church. On this regard, we can enumerate some points we would help in our piety (and that of others as well ;D ) when we are in the Church and during the Holy Mass, OUT OF LOVE AND AFFECTION FOR JESUS, TRULY, REALLY AND SUBSTANTIALLY PRESENT IN THE HOLY EUCHARIST, BECAUSE THE HOLY SACRIFICE OF THE MASS IS THE MOST SUBLIME ACT OF THANKSGIVING AND GLORIFICATION OF GOD DURING WHICH JESUS, OUT OF LOVE FOR US, COMES DOWN TO THE ALTAR TO BE WITH US, AND BECAUSE THE CHURCH IS THE HOUSE OF GOD, A PLACE OF WORSHIP. And for us, my brother priests, LET US STRIVE DAILY TO CELEBRATE THE HOLY SACRIFICE ON THE ALTAR WITH MORE PIETY, ATTENTION AND DEVOTION. THE CHURCH AS A PLACE OF WORSHIP AND THE HOUSE OF GOD. EATING: the Church is not the appropriate place to take some snacks, chew a gum, or take softdrinks ….Another issue would be to feed infants or children who have not reached the age of reason: there’s no problem with that. Nor is there a problem in places where there is a heat wave and the infants or elderly have the risk of dehydration…they can bring a bottled water if there’s a need. APPROPRIATE ATTIRE: What dress would you wear when you are to meet an important person? You would wear something elegant, presentable and appropriate for the occasion. The Holy Mass is a divine moment and it is important to be well-groomed and dressed appropriately with clean clothes. Modesty as well is a must. One cannot wear the same clothes for the Mass and for sports or for the beach. Help others to live the Mass well by living the virtue of modesty, avoiding to attract people with one’s inappropriate attire. It is a holy celebration –the commemoration of Christ’s Passion, Death and Resurrection- and your body is the Temple of the Holy Spirit, so cover it as it is only meant for your loved one. USE OF PHONES IN SILENT MODE: I once saw a sign on the wall of the entrance to a Church in Manila depicting a PHONE with a SLASHED SIGN and with the caption below: “TURN OFF YOUR CELL PHONES SO YOU CAN STAY TUNE-IN WITH OUR LORD” and below, another illustration, showing the dress code and the inappropriate dress for Mass (sleeveless shirts, very short shorts, mini skirts). Out of respect to Our Lord and to contribute to a prayerful and recollected atmosphere, let us avoid at all costs the use of smartphones during the Mass. If one has a justified reason (a doctor on call, a sick person in the family, emergency calls…) one may attend to calls in a discreet manner, having the phone in a silent or vibrate mode and quietly leaving the Church rather than receiving the calls or texting inside the Church. Nevertheless, smartphones have to possibility to contain religious, spiritual books and including the missal…so if you see a person using his smartphone, don’t commit the error of making a harsh, pharisaical judgment, even just mentally, for he may be doing his mental prayer, spiritual reading or following the Holy Mass with his e-book missal. SILENCE AND SPIRIT OF RECOLLECTION: The Church as a house of prayer must be a tranquil place conducive for prayer. It is not proper place to make chit chats with an acquaintance or friends. There will be other places and opportunities for that. If you have children who are crying or who make a lot of noise during the Holy Mass, kindly bring them outside the Church so as to help the priest and the faithful follow the Mass with attention. By doing so, you are living charity to your fellowmen. On the priest’s part….patience…no need to get angry but rather take advantage to pray for the baby and his parents. Social etiquette requires different modes of greeting a person as a sign of courtesy and respect: Japanese make the bow, friends shake hands, soldiers salute their superiors, people stand up when an important person passes by… Jesus is truly present in the tabernacle and AS A SIGN OF SUBMISSION, ADORATION, ACKNOWLEDGMENT, FAITH, RESPECT AND LOVE, WE BEND OUR KNEE WHEN WE PASS IN FRONT OF THE TABERNACLE. In some Churches, the tabernacles are placed on a side altar and IT IS A VERY GOOD CUSTOM TO LOOK FOR THE TABERNACLE TO GREET OUR LORD UPON ENTERING THE CHURCH. The presence of Our Lord inside the tabernacle is indicated by a LIGHTED VOTIVE CANDLE and/or a VEIL COVERING THE TABERNACLE. The altar represents Our Lord Jesus Christ. This is the reason why the priest, in the beginning of the Mass, bows (makes a “reverence” in front of the altar) and kisses it: a kiss directed to Our Lord Jesus Christ. When we enter the Church and see the altar (without the tabernacle located in the center), as a sign of reverence, we make a bow towards the altar which represents Jesus Christ. The reason behind the Church law to live the Eucharistic fast (from food and liquids other than water) is to remind the communicants that we are not receiving an ordinary bread but the Body of Christ, Christ Himself. Those who are sick are not obliged to live the fast. We must ARRIVE ON TIME, WHICH MEANS AT LEAST 5- 10 MINS BEFORE THE START OF THE MASS TO RECOLLECT ourselves and spend a few minutes of prayer. If we wouldn’t want to be late for an important job interview, or for a meeting with a very important person, the more reason we wouldn’t want to be late for the Holy Mass, where it is God who awaits us. The Second Vatican Council’s document on the Sacred Liturgy, “Sacrosantum Concilium” encourages the faithful to actively participate during the Holy Mass. ACTIVE PARTICIPATION REQUIRES PUTTING ALL OUR FACULTIES AND SENSES, BODY AND SOUL, TO FOLLOW THE PRAYERS AND READINGS, RESPONDING OR SINGING TO THE PARTS WHICH CORRESPOND TO THE FAITHFUL, WITH ATTENTION, PIETY AND DEVOTION. ACTIVE PRESENCE: We must not forget that it is possible to be present in the Church (and its vicinities, e.g., outside the Church where men prefer to stay or young people who wish to be with their friends) without having attended the Holy Mass…so some effort we have to exert to make the most out of the commemoration of the Passion, Death and Resurrection of Our Lord, which we celebrate in the Holy Mass. LISTENING WITH ATTENTION: Using a missal or a mass leaflet helps a lot to follow the readings with attention and get the most out of the Word of God and the Holy Mass in general. HOMILY: We, priests, must prepare our homilies in order to transmit the Word of God, avoiding at all costs, lengthy, fuzzy sermons which bore the faithful and losing a very important opportunity in catechizing and evangelizing those who are present. Homilies which last more than 10 minutes are usually counterproductive. Simple, few, concrete ideas with practical application based on the readings of the Mass nurture the soul of our brethren. EACH GESTURE BY THE PRIEST AND BY THE FAITHFUL HAS A LITURGICAL/SPIRITUAL MEANING. For example, we STRIKE OUR BREAST during the “I confess” to signify our contrition; we STAND UP during the Gospel as a sign of respect to the Word of Our Lord Jesus Christ or readiness to do God’s will; we KNEEL DOWN during the Consecration as a sign of adoration and faith on the miracle of the Transubstantiation when the bread is converted into Christ’s Body and the wine, to His Blood. Those who have problems of kneeling down due to weakness, old age, or illness (gout, arthritis etc.) may remain standing. On the PRIEST’S part, when HE OPENS HIS HANDS during the Collect prayer, Prayer over the Gifts and Prayer after Communion, this gesture directed towards heaven is a sign of humble supplication towards the Blessed Trinity to listen and grant his pleas on behalf of the faithful: the priest is a mediator between God and man. When he PUTS HIS HANDS PALMS DOWN OVER THE GIFTS, He invokes God to send the Holy Spirit towards the bread and wine he is about to consecrate “in persona Christi”, meaning “in the person of Christ”. When he genuflects after the consecration of the bread and wine during which the miracle of the Transubstantiation occurs, he does it out of adoration towards the Real Presence of Christ! LET US LEARN TO PRAY NOT ONLY WITH OUR MIND AND LIPS, BUT WITH OUR ENTIRE BEING AS WELL, doing the gestures which corresponds to us during the different moments of the Holy Mass, putting our heart in them as well. With this, we pray with our entire being: body and soul. As a sign of our faith and love towards the Real Presence of Our Lord in the Holy Eucharist, it is important to show some REVERENCE AND AFFECTION TO OUR LORD BEFORE, DURING AND AFTER WE RECEIVE THE HOLY COMMUNION. BEFORE: Make ACTS OF FAITH, ACTS OF LOVE, SPIRITUAL COMMUNIONS. Above all, we should ask ourselves if we have the proper dispositions to receive Our Lord, i.e., if we are in the STATE OF GRACE (with no mortal sin). DURING: When we receive Communion, it is important to acknowledge God’s Real Presence with a sign of reverence which could be a BOW, or KNEELING DOWN…depending on the customs and circumstances in each church or diocese. THE IDEAL WAY TO RECEIVE OUR LORD IN COMMUNION IS TO RECEIVE HIM BY MOUTH. Why? To avoid the possibility that some small particles of the Sacred Host will remain in our hands(if we are to receive it in this manner)and get lost or dropped on the floor. Nevertheless, you have the freedom to choose if in your diocese, your Bishop allows reception of Communion by hand. But the priest cannot force you to receive it by the hand if you wish to receive Communion by mouth. AFTER: Recollect yourself and be aware that you have God in your body and soul! These are the MOST IMPORTANT MINUTES OF THE WEEK (OR DAY). And when two people who are in love are together, they make the most out of it and they are not at all in a hurry to part ways! It is logical and advisable then that you talk to Our Lord: thank Him, tell Him that you love Him, say sorry for your sins, ask Him a lot not only for your needs and those of your loved ones, but for the Pope, for the needs of the Church, of those who are suffering due to whatever cause, for the holy souls in purgatory, for the conversion of sinners, for vocations….Have a big heart and it’s time to be an insistent beggar to Our Lord! The Holy Mass ends AFTER the priest gives the blessing and says: “The Mass is ended, go in peace” (or another formula. As a sign of good education and respect, WE REMAIN STANDING TILL THE PRIEST LEAVES THE PRESBYTERY. If we have received communion, it is good to spend some few minutes of THANKSGIVING to Our Lord in our body and soul, PHYSICALLY PRESENT IN OUR BODY (DON’T FORGET: THIS IS THE MOST IMPORTANT MOMENT OF THE WEEK! ), then leaving the Church quietly so as not to distract others. We must avoid being in a hurry, leaving the Church immediately: it could be a sign of lack of delicacy with Our Lord. Well, these are some ideas which will help us live the proper Church and Mass etiquette out of love, respect and devotion for God really present in the Holy Eucharist. I’m sure there are more details which could be added, since love takes care of little things and consists in small details of affection, but for now, this would be sufficient. Praying daily for the spiritual fruits of this page. Do help me pray for this intention as well. I still have sway over my teenage boys who fold their hands at their heart when standing at Holy Mass. We try not to look around at others for we know what we know and if it was good enough for Mary and the saints, it is our posture too.